There are so many fraudulent websites nowadays whose only intention is to sell crappy products or installing malware applications on visitors computers. First type websites alert the visitor about the presence of the virus and strongly recommend them to perform an online scan to detect them. Once the scan is finished, the visitor will be forced to pay a fee to remove the virus. Second types of websites directly install malicious applications on visitors laptop. Some are intentionally created to host malware programs while others are hijacked by a third-party person. Anyway, it is important to avoid visiting any infected websites to protect our computer. Fortunately, we have some tools to check whether a website is safe to browse. There are certain free tools to check whether a website is safe to browse or not. Most of these tools are free to use. Norton Safe Web is a free tool to check the possible threats posed by a website. To go to Norton Safe browse, follow the link below. 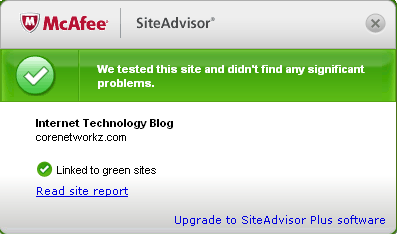 McAfee SiteAdvisor gives a little bit more assistance to check whether a site is free from malicious issues or not. They also check each outbound links on a webpage and tell you if they are safe to click. It is free software and you can download it from the following location. McAfee SiteAdvisor shows malicious websites even from the Google Search Results page. So I really recommend you to download and install this free software on your computer.